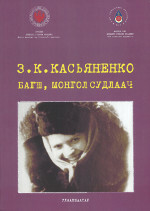 The present volume introduces the proceedings of the conference Z. K. Kasyanenko – Teacher and Mongolist (devoted to her 90th birthday) which was held on September 30 – October 1, 2015 in the Institute of Oriental Manuscripts Russian Academy of Sciences (St. Petersburg, Russia) Z. K. Kasyanenko taught in the Department of Mongolian and Tibetan Studies of St. Petersburg State University’s Oriental Faculty for over fi ft y years. Z. K. Kasyanenko made an invaluable contribution to the teaching of different courses in the field of Mongolian studies. She introduced new training methods, due to which students gained profound and methodically perfect knowledge of the culture and language of the Mongols. Her textbook on the Modern Mongolian language and her studies in Mongolian Ganjur textology have become fundamental works in those fields. Her former students work as researchers at academic centers in Russia, Mongolia and many other countries. She is a recipient of Mongolia's highest state honour, the Order of the Polar Star. The volume includes the works of her former students and colleagues, researches working in the fi elds of Mongolian language, literature, history and textology – all spheres lying within Z. K. Kasyanenko scientific interests. It will be of interest for specialists in Mongolian studies, historians, culturologists and anyone interested in the language, literature, culture, history of the Mongolian people, and peoples in Central Asia. The article reviews the works of the eminent scholar of Mongolian language and literature Zoya Kononovna Kasyanenko. The article represents the review of problems of comparative-historical morphology of the Altaic languages in context of the theory of genetic affinity of the Altaic languages which is considered nowadays proved and having no any alternatives. New works on comparative morphology of Turkic and Mongolian languages, according to the author, continue V. Kotvich’s researches, but in respect of actually morphology are purely confrontational, by their results they do not influence the ideas of the Altaic theory and testify that the volume of communications of Turkic and Mongolian languages at morphology level was insignificant. The author shows the historical identifications of some word-formation and grammatical suffixes and grammatical elements in the Altaic languages and offers new approaches to the identification of the historically general morphemes in the Altaic languages. The author shortly describes the most interesting objects of Mongolian Buddhist art in the collection of the State Hermitage Museum. At first there are the bronze objects, which were cost by the eminent Mongolian master and the head of Buddhist church G. Zanabadzar (1635–1723), and also the sculpture of his disciples. More over in the collection there are the Buddhist objects from Dolonnor in hammering technique, painting scrolls and wood carvings. In a whole the objects are the wonderful examples of the Mongolian Buddhist art of the end of the 17th – beginning 20th centuries. This article investigates questions connected with assimilation of Tibetan literary monument “Mani-kabum” in Mongolia. There exist three different translations of this work into the Mongolian language made in late 16th – middle of the 17th century. Also separate excerpts from “Mani-kabum” were in circulation. There are more than ten volumes containing such excerpts in the collection of Institute of Oriental Manuscripts (St. Petersburg). One of them is the collected volume “Book of selected passages for personal development” (mong. Abiyas kičiyeku teguberi-yin debter) description of which is given herein after. Archive documents in “clear script” (18–20th centuries) are the written heritage of the Kalmyks as well. Their study is essential for understanding of routine labour and life, inner life of nomads, passions and moods, characters and social conflicts. They present the development of a All-Mongol and Slavic written traditions. In this article the author considers the problems of the description of the Mongolian languages and ethnography of Mongol speaking peoples, and also questions of studying traditional book culture in its current state which are based on materials of expedition in Ubsunursky aimak of Mongolia in the summer, 2015. This article is an attempt to reveal the meaning of particles (-daa4) in the Mongolian language in six positions with the imperative form of the verb. The meaning conveyed is: suggestions, advice, requests, confirmations, requirements and instructions. The article analyzes the morphology of case marking in the 18th century Old Siberian Oirat dialect. The allomorphic variation of case suffixes is determined. The place of the Old Siberian Oirat case system among the systems of other North Mongolian languages is established. The article presents a transliteration and commented translation of two official letters written by Mongolian administrative functionaries in the first third of the 19th century. Both were brought from Mongolia by A. M. Pozdneev. Their handwritten copies in 1898 was published by G. Dz. Tsibikov in the collection of materials, intended as a training manual for the practical course in Mongolian language. The above mentioned letters still have not been subjected to any kind of analysis. However, these documents represent a typical examples of Mongolian official correspondence dated to the 19th century. Moreover they are abandoned of little-known facts about the relationship between the authorities of the North Mongolian banners and administrative structures, constituted the personal subjects assigned to the Treasury of Jibzundamba Khutugtu (the Shabi). V. I. Rassadin. On the Role of Imitative Words in the Khalkha Mongolian Verb Derivation —120 This article is about an important role of imitative words in the history of the verbal system development in the Mongolian languages. A special system to transmit images of sounds and human perception of the surrounding reality, as well as images of the results of some human actions originated in the Proto-Mongolian language. This system is characteristic to the Mongolian languages and Khalkha Mongolian in particular. The article studies two student’s reports of their trips to the Kalmyk steppe. These documents are of interest both as field ethnographic papers and as a study of the Kalmyk language; they could be regarded as student’s annual term or qualification papers. They allow researchers to study the oral Kalmyk language of the early 20th century which had certain differences compared to the written Oirat language. This article focuses on analysis of one of the most frequent appellation of Mongolian rulers – eǰen. Determinig of contexts of this term allows to expand knowledge of a sovereign’s status in Mongolian political culture and worldview in XVIIcentury. Studying the term also reveals a correlation between sacred and profane functions of eǰen depending on what Mongolian ruler was defined by this term. The article is devoted to the characteristic of modern Mongolian writer T. Yumsuren (on the example of the collection of short stories “Irbis”) and also of some young prosaists of 21st century who are working in the genre of story. Particularly, the analysis of T.Bum-Erdene’s stories. The writers follow the main theme - morality and psychology of people’s relationships keeping adherence to the realistic manner of writing. The article is devoted to a problem of interpretation of the status of the persons designated in the Mongolian written monuments by a title noyon. The analysis of original Mongolian texts showed that first of all the title нойон marked the representatives of the Gold sort Chingis-hana who were carrying out imperious functions. The title noyon was used in a titulatura of the aristocracy of Khalkh for designation of the special status along with titles of a tayjiand a khuntayji. Do reduced vowels in all vowels of Mongolian produce the same vowel quality? Or do they produce different vowel qualities depending on the preceding vowels? If the latter is true, what difference is there between reduced vowels and non-reduced vowels in terms of vowel quality? To find out answers to those questions, this paper analyzed the vowel quality of the vowels in Mongolian under diverse environments from the perspective of acoustic phonetics and examined how vowel reduction is going actually. The experiment aimed to figure out the vowel quality of the reduced vowel when monophthong is weakened at the unstressed syllable. This article examined how reduces vowel influencing nasal consonant in Mongolian language. Tongue position of reduced vowels of Mongolian language / except labial vowels/ move over /indication of F2 decreases/. In other words, it is pronounced by back of tongue. The Manchu Qing Dynasty promulgated in 1636 claimed its power over the whole of China and surrounding world. However, in reality it maintained control only of a relatively small territory north to the Great Wall. At that time, nobody could predict an early collapse of the Ming Dynasty in 1643. For a successful pursuing of their expansionist policy, the Manchus had to cut all possible contacts with China by the Mongols and the Oirats. To that end were used demands, threats and military alliances. Translation is made of the imperial decree dated 1641 urging the Mongols who stayed in China to submit to the Qing Dynasty. The article refers to two variants of the Mongol manuscript, which includes “Mani”, a prayer formula to the Bodhisattva Avalokiteshvara, and is an example of the text used in the ritual of “Ascension of Mani”. In 1927 the Ministry of Education and the Scientific Committee of the Mongolian Peoples’ Republic suggested that the prominent Russian explorer of Central Asia G.E. Grumm-Grzhimailo should write a textbook on the history of the Mongols. The concept of this work and its structure was discussed by the Russian researcher with the academic secretary of the Scientific Committee Ts. Zhamtsarano in their correspondence. At first planned as the secondary school textbook this project was expanded by Grumm-Grzhimailo into a full scale university course. The article deals with the history of this text preparation and the reasons why “The History” was not published either in Mongolia or in the USSR. In the collection of IOM there are kept three manuscripts of the famous Tibetan-Mongolian dictionary “LishiGurkhan”, which diff er from the famous xylograph. The diff erence lies in the alphabetical words arrangement. Besides, a list of words for each letter ends with a phrase with blessings which includes some words with one and the same grapheme. Such tradition is known as ka ‘phreng and it is helpful for memorizing the Tibetan alphabet. Transliterations and translation of these phrases are presented and accompanied by comparison with the same phenomenon in the “Ocean of Names” dictionary.